North Carolina, like most states, requires a form of preliminary notice to be sent to property owners or other contractors in the chain as an essential step to claiming a mechanic's lien. 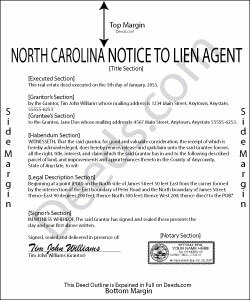 In North Carolina, the notice takes the form of a "Notice to Lien Agent." A lien agent (usually a title company) must be designated by statute for all non-owner occupied projects exceeding a value of $30,000. N.C.G.S. 44A-11.1. The Notice serves the purpose of providing Lien Agent with notice that the potential lien claimant is or will be providing labor, services or materials to the project property that could be the subject of a later lien claim. The Notice to Lien Agent must include: 1) the potential lien claimant's name, address, telephone number, fax number (if available), and email address (if available); 2) the name of the party with whom the potential lien claimant contracted; 3) a description of the real property sufficient to identify it; and 4) a statement giving notice of the potential lien claimant's right to subsequently pursue a claim of lien for the improvements to the property. N.C.G.S. 44A-11.2(i). The Notice to Lien Agent must be filed within 15 days of the potential lien claimant's first furnishing to the project property. N.C.G.S. 44A-11.2(l)(1). Serve the Notice to Lien Agent on the identified lien agent using any of the acceptable means of service in the State, although certified U.S. mail is usually the most convenient option. This article is provided for informational purposes only and should not be relied upon as a substitute for the advice of a legal professional. Please contact an attorney with questions about sending a Notice to Lien Agent, or any other issues related to liens in North Carolina. Denise G. said: It was so easy to locate and download all the forms I needed. Saved so much time. Lisa B. said: Awesome service. User friendly, simple, easy and quick to fill out with instructions and sample copy and print. Reply from Staff: Thank you Lisa, we appreciate your feedback.